In Brief: Hike from the tiny settlement of Hemp Village through the hills to the Gubeikou Great Wall. On the Great Wall at Gubeikou. 3–4 hours start to finish over 12km. The starting point for this hike, Hemp Village, is a tiny settlement hidden away at the end of a long valley. In the hills behind Hemp Village is the line of Great Wall that joins Gubeikou and Jinshanling, which we’ll follow through the hills. To get to Hemp Village we walk in from the main highway, following a gravel road through small collections of houses until we get to the end of the road, where we’ll find the house of our local guide. Arriving at Hemp Village from the Gubeikou side. From our local guide’s house we’ll follow a trail he made that will lead us up towards the Great Wall. On this part of the hike we’ll have excellent views of the wall, but we won’t be able to climb on top – this stretch of wall is closed to hikers because it borders a military area. Instead of walking on the wall here – and running the risk of soldiers joining our hike – we’ll stick to the trails that run through the hills and valleys in this area, walking through some pretty farmland, with views of the Great Wall all the while. Eventually the trail will take us up to the wall, and after a bit of a hill climb we’ll reach the 24-Eyes Tower, the tallest tower of the Gubeikou stretch of Great Wall. It used to be that there were six big windows on each side of the tower, adding up to twenty-four. But during the fighting between the Chinese and Japanese armies in the late ‘30s, two of the sides of the tower were destroyed by bombing. As well as a few destroyed towers, you can also spot bullet holes in the Great Wall in this area. From the 24-Eyes Tower we’ll follow the wall to the west, passing through a lot of towers – some in good condition, some tumbled down to foundations only. For most of this last part of the hike we’ll be on the wall, except for a short detour along a trail through a small pine forest. As we near the end of the hike, we’ll see the highway in the broad river valley below, with another line of Great Wall on the other side of the river. Before we get that far we’ll reach the point where the road cuts through the wall, and we’ll follow the road down into the village where we’ll have a nice big lunch of country-style Chinese cooking before we head back to the city. Weather note: if rain or thunder is forecast we might not be able to hike. We have another Great Wall hike the next day, just in case. There are a few places along the way that are either narrow, steep, slippery, or all three at the same time. 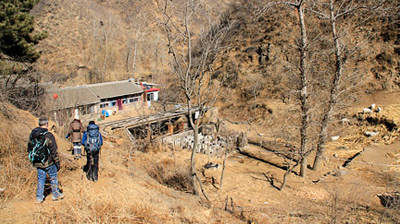 Seventeen great photos from the walk from Hemp Village to the Great Wall at Gubeikou. Twenty-three photos from the hike from Hemp Village to Gubeikou. See fifteen photos from our Christmas Eve hike from Hemp Village to the Gubeikou Great Wall. 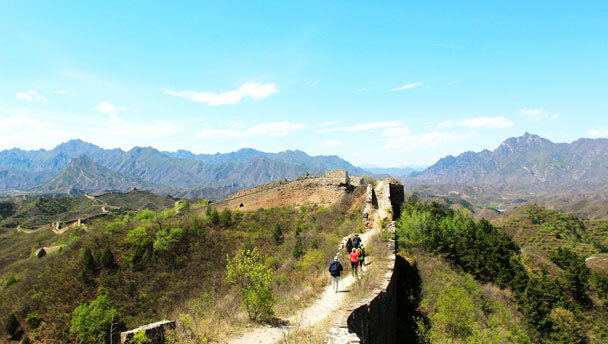 Photos from a blue-sky hike from Hemp Village to the Gubeikou Great Wall. We were out for a hike just after the first snow of the new year – see photos of snow on the Gubeikou Great Wall. See photos from the Great Wall at Gubeikou and the farmland around Hemp Village.